Summary produced in 1997 by John Lindgren from obituary and other notes. Miss Signe Elfrida Laven (pronunciation : Lav-ain ), called “Mona”, was born at Gotene, Sweden, on 6th Sep 1884. She grew up in Enebacken Manor in Holmestad parish, Vastergotland, one of the estates of her grandmother, widow of Karl Holmen. 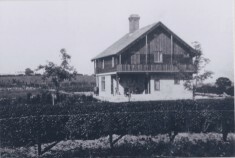 Her paternal grandfather was both a farmer and a regular soldier in the Hussars, but her father studied at a commercial college and went into business, adding the Nyman to the Holmen estates. Signe was fond of recalling the traditional crafts, medical remedies and folk-lore which she learned in childhood from the older countrywomen. After attending the well-known Girls’ High School at Skara, the cathedral town of the province, and then a finishing school, she persuaded her father to send her to the small and select Arvedson’s Gymnastika Institut at Stockholm. It gave a combined training in educational and remedial gymnastics and physiotherapy, directly based on the training of Per Henrik Ling, regarded as the best in the world. On graduation in 1904 as Gymnastikdirektor, she practised for three years in New York, as well as doing six months nursing to qualify for the Red Cross Massage Corps. She returned to work in Gothenburg where, from 1907 to 1909, she had a private practice. Signe was invited to Harston, Cambridge, in late 1909 for two months, to attempt to treat Miss Mary Greene, the artist, for neuritis. Her physician had found the case most intractable, and arranged for Signe without any real hope of relief. Mary Greene responded really well, and the physician and the Greene family, living at Harston House, persuaded Signe to remain and work in Cambridge. 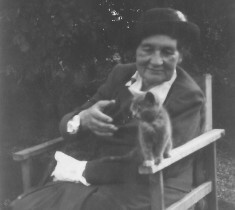 Signe stayed to become Miss Helen Greene’s assistant in a physiotherapy practice which had a Swedish Gymnasium, and then soon bought her share, becoming a partner of a Miss Willis in 1910. The existing Swedish Gymnasium was near the old Addenbrookes hospital in Trumpington Street, but was unsuitable, and a new one was built on Union Road in 1911, opposite the Perse Girls School. On Miss Willis’ marriage in 1912 Signe became sole owner of the business, with Swedish and English assistants, at one time she had three, until 1944. During the 1914-18 war Signe gave much voluntary help in military hospitals and both trained and supervised a War Emergency Massage Corps. Signe was responsible for the general direction of physical exercises including remedial drill, firstly at St. Mary’s Convent,(1911-12) and then from May 1913 until 1934 at the Perse School for Girls, overlapping with weekly instruction at Berkhampstead School. On two occasions she and her staff taught the entire school Swedish folk-dances, which were performed in authentic national costume. She also held private gymnastic classes for children of all ages, and Keep Fit classes for adults. She also took an interest in the wider community and in social welfare, often treating patients for a nominal fee or none. In 1938 Signe suggested to the medical adviser of the Cambridge boat crew that the men might benefit by specialised exercises designed to give a more balanced muscle development than rowing alone provides. Her offer to give a free course was welcomed and accepted again in 1939, when the Cambridge boat’s success brought her much satisfaction. It was a source of acute regret to her that failing health restricted her part in the ‘war effort’ of 1939-45; but she helped to distribute milk to schools, gave generous hospitality to European Allies temporarily resident in Britain, and shared her home for seven years with a ‘foster-daughter’, a young refugee from Nazi Germany. The Joos Ballet was allowed to practice in the Swedish Gymnasium, at a time when circumstances made it very difficult to keep their art alive. Signe often visited her parents, brothers and sisters in Sweden, and through the attractive Swedish furnishings of her Cambridge Institute and Harston home spread knowledge of Swedish art and culture generally. She was largely her own architect, in collaboration with the local builder J.Northrop, for the main building at Sunbourn. She was a great friend to Ethel John Lindgren and invited Ethel to share her house in 1933, when she came to England with her son John, who became Signe Laven’s godson. In 1944 Ethel bought the house from her, and looked after her in her ailing years, with the help of nurses, and Swedish and Finnish ‘au pairs’. Signe died in 1955, at Sunbourn. I have the original letter-head embosser from those early days on Union Road. The text reads: The Swedish Gymnasium, Union Road Cambridge. Te. 24. With an early telephone number like that it must be original.